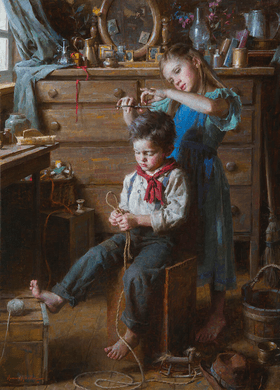 Morgan Weistling Artist Signed and Numbered Limited Edition Canvas Giclee:"Barbershop, The"
Edition:: Artist Signed and Numbered Limited Edition with COA to 50 with 10 AP's. About the Artist : Morgan Weistling is nationally recognized as one of America�s top contemporary painters today. After a 14 year career as an illustrator, Morgan left it all and soon became known nationally for his exquisite oil paintings that showcase his well honed drawing ability and his skilled control over values, edges and light. He is able to draw upon his many years as a illustrator to create masterful compositions with multiple figures as well as single figure settings. He captures the mood and atmosphere of the past and his attention to the historical aspects of his subjects comes from his desire to portray the truth and beauty of America�s pioneering spirit. Coupled with a deep sense of history, his paintings are filled with details that always tell a story. Morgan notes, "In my paintings, I hope to communicate with the viewer the same emotional response that goes far beyond what decorative art does. There is always that special human moment that I look for that rings true. It can be as simple as the little odd way a child�s feet might be a bit pigeon-toed and that little detail will draw you into the little world I am creating and make you believe it." His canvases are filled with brushwork that tell a story beyond the subject matter. Like a skilled movie director, he manipulates the focus of interest with just suggestions and impressions of forms that are barely realized and allow the viewer�s imagination to fill in the details.